Third-generation Cayenne styling more sporty than current version. The Cayenne Turbo Coupe, meant to rival the BMW X6 and Mercedes-Benz GLE, offers up to 542 hp and a 0-62 mph time of 3.9 seconds. Porsche takes aim at the BMW X6 and Mercedes-Benz GLE with a heavily restyled version of its third-generation Cayenne featuring a shallower windshield, a coupe-inspired profile and liftback-style tailgate among other distinctive touches. Unveiled Thursday at the German automaker’s headquarters in Stuttgart, Germany, the new Cayenne Coupe is available to order now and planned for North American delivery by the end of May. Two gasoline-powered models form the initial lineup. U.S. pricing wasn’t immediately available. In Germany, however, the new Cayenne Coupe is priced at €83,711 ($95,059), while the more powerful and comprehensively equipped Cayenne Turbo Coupe is priced at €146,662 ($166,546). This positions them a respective €8,883 ($10,087) and €7,812 ($8,871) above their corresponding Cayenne SUV siblings. Styling of the Cayenne Coupe’s body is aimed at giving it a more sporting profile than the more upright Cayenne SUV. Key changes include a shallower windshield and a more heavily curved roofline that extends back to form an integral part of a large liftback-style tailgate. Redesigned rear doors and wider fenders bring an additional 0.7 in. (18 mm) in width, according to Porsche, while the rear license plate has been repositioned into the rear bumper. As with the Cayenne SUV, the new Porsche model receives an active rear spoiler. It works in combination with a roof spoiler, extending 5.3 ins. (135 mm) above 56 mph (90 km/h) to increase downforce. The Cayenne Coupe comes with a panoramic roof featuring a glazed area of 9.9 sq.-ft. (0.9 sq.-m) and integrated roller blind as standard. Buyers also will be able to option the Porsche with a contoured carbon-reinforced plastic roof similar in style to that featured on the 911 GT3 RS. The optional roof is available as part of one of three lightweight sports packages, which also include special exterior design detailing, 22-in. wheels, carbon-fiber and Alcantara interior trims and, for the top-of-the-line Cayenne Turbo Coupe, a sports exhaust. Inside, the Cayenne Coupe’s 4-passenger layout has individual seats up front and a newly designed bench with two individual seats divided by a center armrest at the rear as standard. Buyers can opt for an optional 3-seat bench in the rear at no additional cost. Rear-seat occupants sit 1.2 ins. (30 mm) lower than in the Cayenne SUV, freeing up rear-seat headroom despite the more sporting roofline, according to Porsche. Cargo capacity is put at 22.1 cu.-ft. (625 L) in the Cayenne Coupe, rising to 54.1 cu.-ft. (1,531 L) when the rear seats are folded down. This is 5.1 cu.-ft. (144 L) and 6.0 cu.-ft. (170 L) less than the Cayenne SUV. The Cayenne Turbo Coupe offers even less space at 21.2 cu.-ft. (600 L) and 53.3 cu.-ft (1,508 L). By comparison, the soon-to-be-succeeded second-generation BMW X6 and first-generation Mercedes-Benz GLE Coupe provide a respective 19.4 cu.-ft. (549 L) and 24.4 cu.-ft. (691 L) of nominal trunk space. 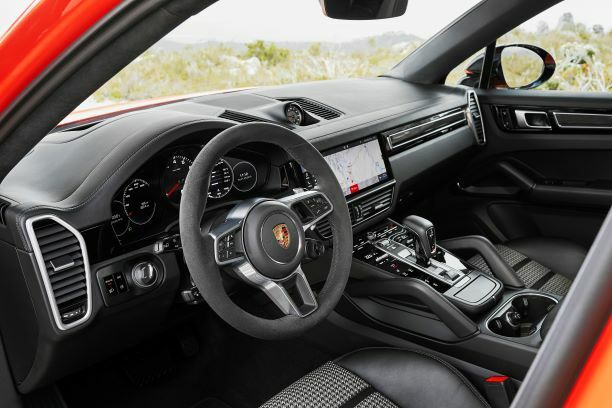 Up front (below, left), the dashboard, digital cluster display, touchscreen infotainment system and other controls are shared with the Cayenne SUV, alongside which the Cayenne Coupe is produced at Porsche’s Leipzig factory in Germany. The new Porsche model initially will be sold with the choice of two gasoline engines, though others, including a pair of gasoline-electric plug-in hybrid drivetrains shared with the second-generation Panamara, are expected to be added to the new lineup by year’s end as part of Porsche’s electrification push. The initial price-leading Cayenne Coupe runs a turbocharged 2.9L V-6 producing 335 hp and 332 lb.-ft. (450 Nm) of torque. In combination with a standard 8-speed automatic gearbox, it provides claimed 0-62 mph (100 km/h) acceleration in 5.9 seconds and a top speed of 151 mph (243 km/h) in European specification. The Cayenne Turbo Coupe is fitted with a twin-turbocharged 4.0L V-8. With 542 hp and 568 lb.-ft. (770 Nm) of torque and the same gearbox as its less-costly sibling, it provides the new high-riding Porsche with a claimed 0-62 mph time of 3.9 seconds and 178 mph (287 km/h) top speed. The 567-hp twin-turbocharged 4.4L V-8-powered BMW X6M and 577-hp twin-turbocharged 4.0L V-8-powered Mercedes-AMG GLE63S Coupe possess the same claimed 0-62 mph time and limited top speed of 4.2 seconds and 155 mph (250 km/h). Porsche is yet to detail changes to the suspension of the Cayenne SUV in the creation of the Cayenne Coupe. But it confirms all models receive speed-sensitive power steering, 20-in. alloy wheels, Porsche Active Suspension Management, Sport Chrono Package, Park Assist and a reversing camera as standard.